Recently, we had the opportunity to sit down and chat with Patrick Gelsinger, Senior Vice President and General Manager of Intel's Digital Enterprise Group. It was a great opportunity as Mr. Gelsinger is obviously no small fry. 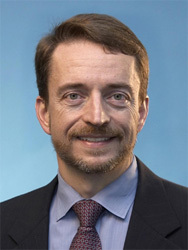 He holds six patents and six applications in the areas of VLSI design, computer architecture and communications. He has more than 20 publications in these technical fields, including "Programming the 80386," published in 1987 by Sybex Inc. His promotion to group vice president at age 32 made him the youngest vice president in the history of the company. Pat G, as he's apparently known in Intel, first filled us in on Intel's 45 nm plans, the tick-tock development model and Nehalem before letting us fire some questions. Let's take a look at what we covered. Pat talks about Intel's tick-tock candence and how it's helping them deliver processors like Nehalem, Westmere and Sandy Bridge on time. Pat talks about Intel's transition from 65 nm to 45 nm. Pat talks about the new hafnium-based metal gate transistors and how this revolutionary new technology will help Intel improve their processors. Pat reveals some secrets on the upcoming Penryn processors, including what's in store for Q3'08. If you are wondering about Nehalem, then make sure you check out what Pat has to say about Nehalem! As we mentioned before, Intel synchronizes their processor strategy on a tick-tock cadence. Just like clockwork, Intel switches between architectural changes and improvements in process technology every year. In other words, we can count on a new microarchitecture and process technology from Intel every 2 years or so. 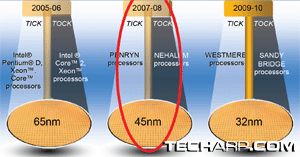 The tick phase heralds an improved process technology, like the introduction of the 65 nm process technology in 2005. This would be followed by the tock phase the next year, which would feature a new architecture, or at least an improved one. The cycle then restarts a year later with Intel introducing a new process technology (tick again). Intel is about to enter a new tick phase with the introduction of the Penryn family of 45 nm processors on November 12, 2007. Even before it is released, Intel is already demonstrating the next-generation Nehalem processor. So, it will on cue for a release in 2008. So is the next development in silicon fabrication technology - 32 nm. Intel is already producing samples of 32 nm chips for tests. They are confident of delivering the Westmere family of 32 nm processors by 2009. As for Sandy Bridge, Pat G did not go into any details, but it will feature a new microarchitecture and a team in Israel is already working on it for a scheduled release in 2010.